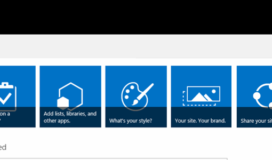 SharePoint 2016 has been redesigned to focus on providing a modern user experience. If you have been using Office 365, you will notice that SP 2016 looks a lot like Office 365. SharePoint 2016 provides users easy and simplified access to people, applications, and content so users can be more productive. At the same time, SP 2016 provides a more fluid design that responds perfectly across all mediums (touch-enabled tablets, phones, laptops, or desktops). Let’s discuss some of the components that provide this intuitive and modern user experience. SharePoint 2016 user experience is clearly inspired by Office 365. For example it provides an Office 365 style menu with access to Newsfeed, OneDrive, Sites, etc. At the same time sharing a site is very simple. On every page of the site, there’s a “Share” button in the top right corner making it more natural for users to share sites and files. Part of sharing is also security. By clicking on “Shared With”, users can see the names and pictures of the people who have access to the site. So whether you are working with employees, customers, partners, or suppliers, these external sharing enhancements can help you work efficiently, and effectively with improved collaboration between users. SP 2016 has introduced more controls for working with files and content as SP 2016 inherits the new and improved control surface from SP Online and OneDrive for Business. The user experience for file creation, sharing, and management is much simplified. The interface for OneDrive provides an auto-completion search bar as well as access to the content of sites you’re members of. There are also new methods to access document libraries by using site folders to bookmark sites for quick access to their content from OneDrive for Business. Durable links provide an improved experience to ensure that the original link still works when files are moved or renamed. The feature enables discrete URLs on visibility and has resolved many current issues around document links. The need to provide support for large files such as video and audio has increased significantly over the past several years. In the modern world of collaboration you can’t be limited to just text-based files as sharing modern media, videos, and audio is very common now. This new feature allows for uploading files up to 10 GB. File size continues to grow at an exponential rate and SP 2016 implements the latest in transfer technologies to drive increased upload and download performance while maximizing the use of unclaimed bandwidth. SP 2016 delivers a consistent experience across screens, whether using a browser on the desktop, a mobile device, or a tablet or slate. This allows users to easily transition from one client to another without having to sacrifice feature fidelity.